Creating and maintaining a strong, unified brand is a crucial aspect of running a business, and one that should not be overlooked in any capacity. Any business selling consumer products in the Minneapolis or surrounding area should absolutely include custom designed labels in their budget. Creating a stellar product is not enough. Making sure customers choose your product over many other choices is the ultimate goal and custom labels can help with just that goal. There are many benefits of using customized branded labels for businesses, but one of the most important aspects is the ability to stand out on the shelves from the competition. Customized labels ensure potential customers recognize your brand and make them aware of it in the first place. You may have an excellent logo, brand name and slogan already in place, but using those elements consistently on consumer products on the shelves will reinforce the brand with customers. They are well aware of the brand when they purchase a product and understand your brand association with the product from the get-go. Plus, having aesthetically pleasing branding and packaging does not hurt sales! Another benefit of custom branded labels? The intrinsic value of label is in the protective layer and communication. Detailed labels can relay important information keeping your brand and company safe from lawsuits. It adds business liability protection by disclosing certain warnings right on the packaging. For example, the FDA in the United Sates requires specific nutrition information displayed on labels, not only to inform customers, but also to protect brands. If someone purchasing a food product has an allergy a business brand cannot be held liable if a consumer chooses to not read the labeling and has a reaction to the product’s ingredients or dosage since all required information was on the label. A prime example of the reason labels on products are important is the infamous case of Liebeck vs. McDonald’s. Before the mid-1990s, hot drink cups did not have a label warning customers a product was hot. After a woman received severe burn wounds as a result of mishandling coffee she did not realize was at dangerous heat levels, she sued McDonald’s for damages in court and won. Labels and special messages on products can help ensure something similar doesn’t happen to your brand or business. Directions for use, for whatever the product is, can help protect your brand and ensure consumers understand the product’s use and intent as best as possible and avoid any confusion or unfortunate situations. As well as making sure instructions, ingredients, dosage or disposing instructions are clear on a label, it’s also important to not cut corners on production and procure the highest quality label you can. When customers are confused by the product and its contents, it is not only unprofessional, but it is also leads to the aforementioned legal issues. When The Pressed Juice Company’s supplier created and completed production of product bottling with spelling errors and incorrect ingredients on the labels, Riffland Solutions stepped in and took over the project; creating accurate labeling for the company. Riffland Solutions, now certified by the Women’s Business Enterprise National Council, is the number one hard material marketing company in the Midwest region, and will never cut corners on your custom labels. 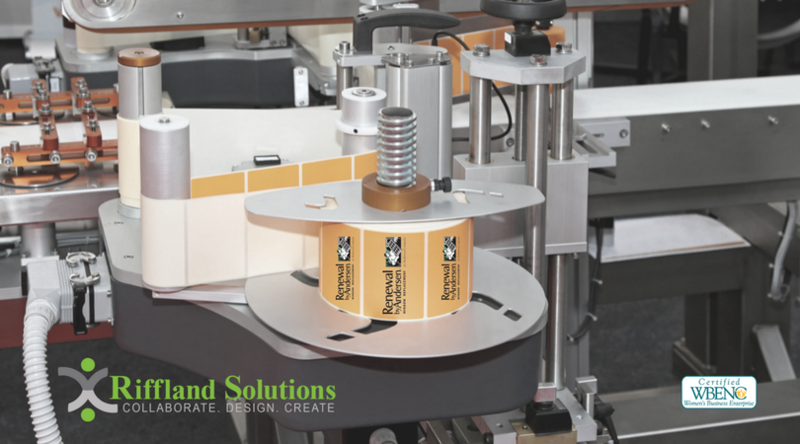 So, whether you need custom designed labels created for the purpose of marketing, for safety & security, shipping & tracking, or for inventory control purposes – Riffland Solutions has you covered!